Most people will remember the basic magic square from their school days. It looks like a noughts & crosses 3 by 3 grid, but without the Xs and Os. Through a fluke of nature it is possible to place the numbers 1-9 into the nine cells of the grid in a certain configuration so that the sum of all vertical columns and the sum of all horizontal rows add up to the same number. Would it grab your imagination if I were to tell you that the two diagonals of the 3×3 magic square also amount to 15? Anyhow, the point of this post is to highlight a wee obscurity which I came across a few full moons ago, whilst playing with the magic square of 4×4, which constantly produces the number 34 when magically arranged. This square is even more complex than the 3×3. Where as only the verticals, horizontals & diagonals of the 3×3 magic square all tally up to the same number, when one contemplates the 4×4 magic square, you will see that this square boasts additional qualities; such as any quarter of the square (ie, the four numbers in the bottom left corner or the four numbers in the top right corner) add up to the number 34. The four numbers in the middle of the square also add up to 34, as do the central two squares on the left & right columns and the central squares on the top & bottom rows. Oh did I mention the four singular corner squares also add up to… Yep! you guessed it, 34. I was quite taken aback when I first saw how cunningly designed nature had made these numbers to sacredly sit together. I was even more stunned when my inquisitive mind asked what would happen if I drew a line through the numbers connecting them in numerical order? Similar to the children’s “Dot to Dot” book, where the child joins the numbers to reveal a picture. The 3×3 was symmetrical on a diagonal axis, but the 4×4 was illuminating! This continuous line created 2 isosceles triangles, one pointing down one pointing up. 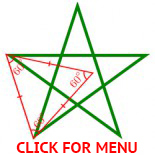 It also created two five pointed stars, again one pointing down and one pointed up. These four shapes were all on a vertical column in the middle of the magic square. On the left and right of this central four shapes lay two further triangles. The triangle on the left pointed up and that on the right pointed down. Thoughts of “As above, so below” echoed through the pages of my mind and as I further flicked through those pages I remembered the image of the Baphomet from the front cover of a book which I had read 2 years before. (Transcendental Magic by Eliphas Levi – 1855). I couldn’t help but notice the initial similarities between the two images. I scanned them into photoshop, dropped the opacity, scaled the grid to sit over the Baphomet image and hey presto! They sat in a manner that to my eyes was not coincidental or pot luck. Is it possible that the black isosceles triangle represents the head & horns, the red star = the torso, the yellow star = the folded legs, and the white triangle = the half globe that the Baphomet sits on. I have searched for information on this obscurity, but as of yet have found none. I would like to know whether the renowned magician Eliphas Levi knowingly embedded the likeness of the path formed from the 4×4 magic square of Deus Pater (Jupiter) into his drawing of Baphomet or not? This entry was posted on February 11, 2012 by SPJ in Numbers and tagged 3x3 magic square, 4x4 magic square, Baphomet, Bathomet, Eliphas Levi, Magic square, Numerology, Occult, western occult tradition.